I will never use another type of deoderant again. It stays off of my clothes and smells great all day. I don't look for another deoderant. This deoderant will last me a good 3 months. I love that no matter how much I sweat it takes care of keeping the smell away. I can wear it for 12 hours and still smell fresh. Although it says clear I still get my shirts stained. 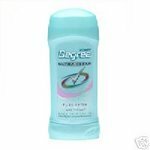 The great thing about this deoderant is that it gives you great odor protection and sweat protection as well as keeping your clothes clean and chalk-mark free. They have many different varieties that smell great and fit your mood.